​Snap Inc. (SNAP.N) soared in pre-market trading Wednesday, one day after the company blew past revenue expectations in its fourth-quarter results. 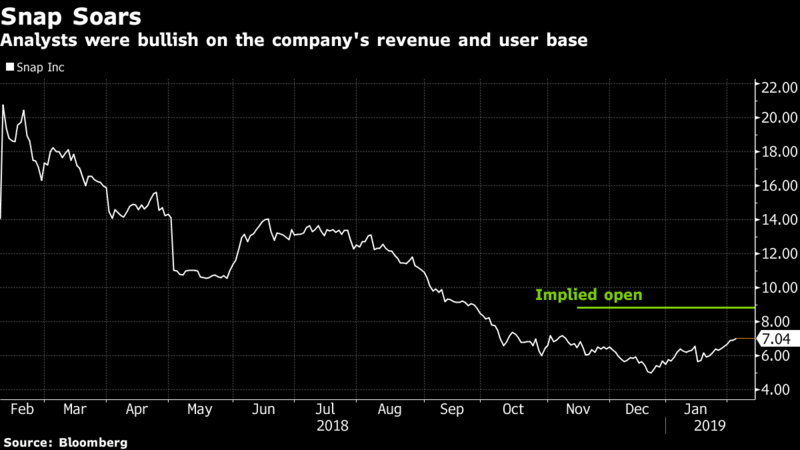 The social-media company, shares of which have languished in a long-term downtrend, also pointed to a stabilizing user base, helping to diminish a primary concern held by investors. The stock jumped as much as 26 per cent before the bell, implying that it would open at its highest level since September. The stock had lost 49 per cent in the past year through Tuesday. Social network peer Twitter Inc. also gained 1.3 per cent in early trading. Kessler also sees “continued solid ad growth,” and an “outlook for improved EBITDA performance with continued solid top line growth and relatively flat” operating expenses. Lifts price target to US$8 from US$6 “to reflect the stabilization of DAUs, incremental near-term cost efficiencies, and expansion of comp group multiples.” Keeps neutral rating. Lifts price target to US$9 from US$6, and boosts EBITDA estimates for 2019 and 2020. Keeps neutral rating. Lifts price target to US$10 from US$8 but keeps sector perform rating. Calls results a “step in the right direction.” Raises price target by US$1 to US$6. Price target lifted to US$5.50 from US$5, but underweight rating remains.